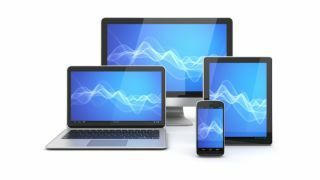 Worldwide shipments of tablets and smartphones are more than compensating for the continuing slump in PC sales, promising to take the total computing market to 2.35 billion units over the course of 2013, according to Gartner. The IT analyst house is forecasting a 5.9% increase for the total number of devices worldwide, with a further 6.7% rise to 2.51 billion next year. There's no surprises in the breakdown, which show PCs continuing their slide to account for 305.2 million shipments this year, while tablets are on a sharp upward trajectory to hit 201.8 million, and phones are creeping up by 4.3% to 1.82 billion. Shipments of ultramobiles, which include Chromebooks, are in a lower league but doubling annually, set to hit 20.3 million this year. Gartner says this trend should get a further boost later this year when new designs running Windows 8.1 on Intel's Bay Trail and Haswell processors hit the market. It won't be plain sailing for the tablet and smartphone sectors, however, with a slump possibly on the cards. Gartner sees a shift from premium to basic tablets coming, pointing to the iPad mini accounting for 60% of iOS sales in the first quarter of 2013 as a sign of things to come. The analyst house also sees longer life cycles affecting shipments. Ranjit Atwal, research director at Gartner, said: "The increased availability of lower priced basic tablets, plus the value add shifting to software rather than hardware will result in the lifetimes of premium tables extending as the remain in the household for longer. We will also see consumer preferences split between basic tablets and ultramobile devices." He added that people are also hanging on to the smartphones for longer, which will place pressure on prices and manufacturers' margins, and could spell pricier handsets for consumers. Given that phones account for the largest segment, it's no surprise that Android continues to lead the competition between operating systems across phones, tablets and PCs combined. The Google OS accounts for 37% of 2013 device shipments to date, followed by Windows with 14.4% and iOS/MacOS with 12.6%.